Katya Gardea Browne began her studies in art by attending Yale University, completing degrees in Fine Arts and Film Studies, where she was recognized for her abilities and was awarded Yale's prestigious Study Award. 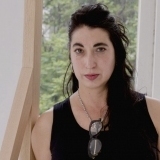 Her work incorporates sculpture, painting, video, architecture, installation and research. She has been affiliated with the Goethe Institute (Sao Paulo and Puerto Alegre, Brazil) and the Alfred Ehrhardt Stiftung in Berlin, where her work on "NatureCultures," in the subject of Art, Science, and Technology, was featured. Katya's body of work is exhibited in museums in Mexico City; and in the international art context, she is now a speaker on "Interviews from Yale University Radio WYBCX" on the subject of art, photography, architecture, and the urban landscape, and a speaker on Quinnipiac University's program, where she has spoken of painting and Mexican muralism from the 1930s and contemporary art practice. Of late she added to her studio a production company, KGB STUDIO, in order to incorporate her art practice and interests. In recent years her main concerns involve the relation between Art, Science. and Technology, as well Documentary Film. Katya Gardea Browne is a Mexico City-based artist currently exhibiting her work internationally, spending time between Mexico, New York and Berlin. She is fluent in Spanish, English, and German.